Occasionally, Brad or I will hit up the RedBox for a little weekend movie night fun. We don't usually have anything in particular in mind that we know we want to see, so one or the other of us is left to guess which movie would be mutually enjoyable (ie: no movies where everyone has English accents cuz Brad says he doesn't always get what they're saying and also no movies where there's a possibility that anyone will break out in song cuz that makes Brad uncomfortable). We also have to find something that's short enough that neither of us will fall asleep before it's over (so under two hours). This methodology of movie selection is further refined by our belief that when nothing else stands out -- we can generally rely on picking one that features one or more of the following people: Steve Carrell, Paul Rudd, Tina Fey and/or Will Ferrell. There was this great moment at the beginning of the movie that made me think about writing. 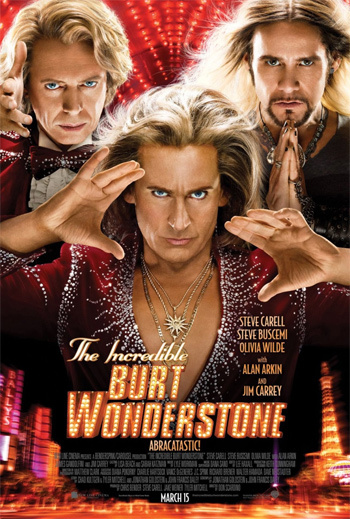 In the opening a you meet Burt Wonderstone as a kid. He eats some tree bark, gets punched by a bully and comes home on his birthday to an empty house. His mom has to work, but she left a birthday present for him to open by himself, dinner in the fridge and his favorite cake on the counter. Only the cake is a box mix that Burt will have to make. She leaves him instructions for how to make the cake which includes stirring in two eggs -- which he will have to pick up from the grocery store because they're out. The scene ends with him eating the cake, on which he wrote "Happy Birthday to Me" and opening his gift. I loved this scene -- not because poor Burt Wonderstone had the crappiest birthday ever -- but because one or more of the movie's six credited writers were faced with the challenge of imagining the crappiest birthday ever and came up with this one where the kid has to make his own cake (but not before running to the store first to get some eggs). Brilliant. This is kind of how novel-writing has gone for me -- I have flashes of these "crappiest birthday ever" moments that my characters are in and I write them down -- knowing that eventually, I'll have to go back and put them in some sort of sensible order while also sewing them together in a meaningful way. It's not novel-writing so much as word quilting. I've never written a novel before -- so I'm not sure if this is good form. But it's actually how I end up writing everything -- from news stories to blog posts to columns. I hardly ever start at the beginning (even though I hear it's the very best place to start). Sometimes I start at the end or in the middle and then go back to the beginning or hang around in the middle then head to the end then back to the beginning -- or maybe it will be beginning end and then middle. Hopefully, it works out -- otherwise, I'll just have a file full of random disconnected thoughts featuring imaginary characters. If nothing else I'm pretty sure I have at least one or two scenes that are of "The Incredible Burt Wonderstone" caliber. So that's something. * Thanks to free premium channel weekends on DirectTV, I've also seen "The Descendents" "The Help" and "The King's Speech." In reviewing the list of 2011 Oscar-nominees I was surprised that we'd seen five of the 10 nominees ("Toy Story 3,"** "Black Swan,"*** "The Fighter," "Inception," and "The Social Network") -- until I realized that we saw most of these right before Lily was born when we were trying to stockpile enough moviegoing to tide us over for the next 20 years or so. ** I remember sobbing while clutching my giant pregnant belly in the theater during the opening of "Toy Story 3" as they fast-forward through Andy's childhood because I realized that my unborn child would one day leave me for college. Hormones might have played a small role in this moment. *** Watched this one with Brad's parents. If you like long, awkward silences on movie nights, may I suggest watching "Black Swan" with your in-laws. Here's a novel novel idea: A dozen wannabe novelists, all clutching their moleskin notebooks filled with disconnected ideas and unfinished scenes, attend an expensive "You CAN Finish That Novel," seminar led by famous writing coach Throckmorton Schlumpowicz. It turns out that the plot and character snippets within their 12 notebooks, when combined, coalesce into The Great American Novel. Schlumpowicz knows this, and tries to steal all of the notebooks to further his own career. They discover his plan and kill him with a trident. I'm way ahead of Throckmorton Schlumpocwicz...(Did I get spelling right?) This is like literary insider trading...Mwaaaaa haaaa haaaaaa! I think the three of us should attend a Throckmorton Schlumpowicz seminar, I'm pretty should we could actually come up with a really great novel -- and I'm Laura, I'm sure Finn would know where we can get our hands on a trident (or at least be willing to forge one from scrap metal he's dug up in the woods).